My friend Kathy has been trying to get me to visit her homeland Taiwan for years. Literally, about eight years now. 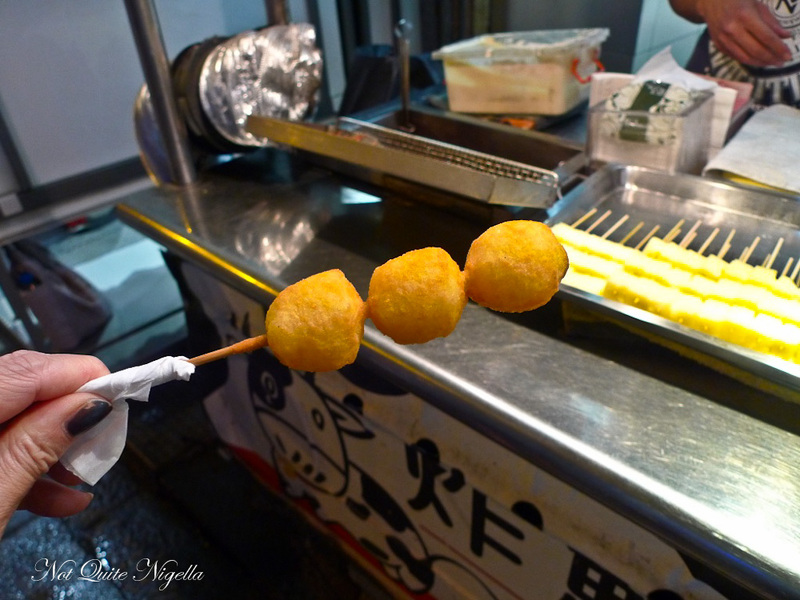 She has tempted me with pictures of Taiwan's famous night market food and my stomach would growl at the idea of these interesting and never before seen items. 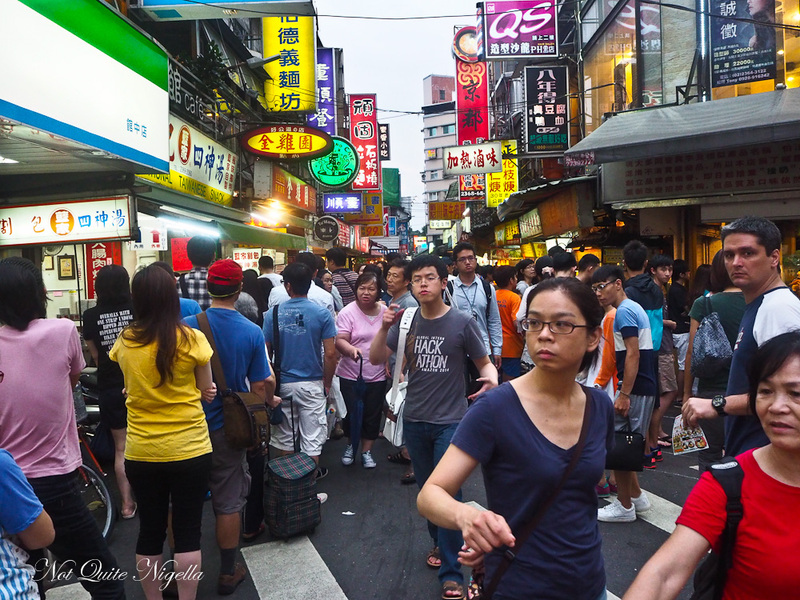 So when I found myself going to Taiwan, Kathy was the first person I consulted about the night markets. 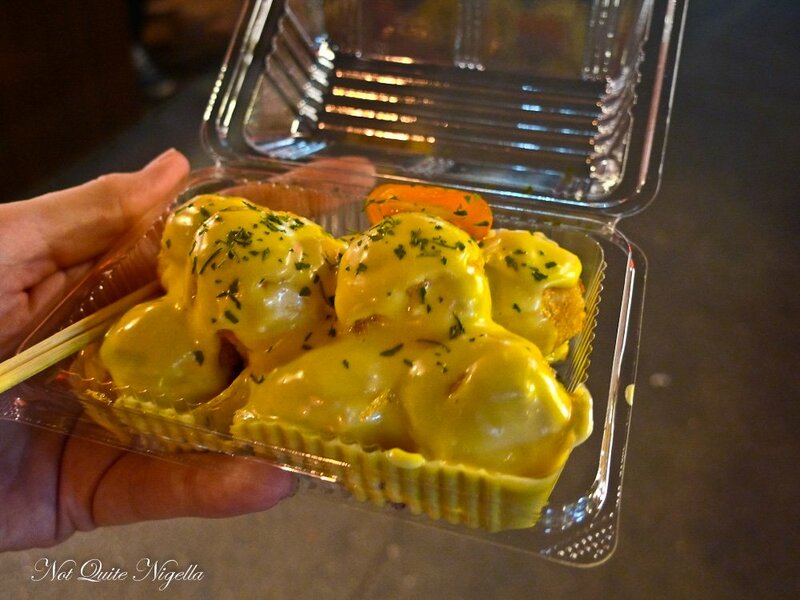 Taiwan's night markets are legendary. 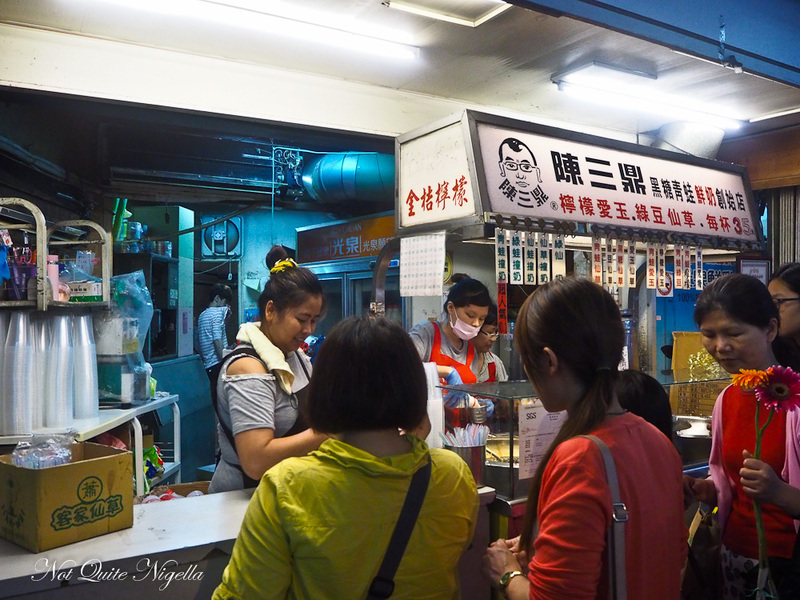 With over 100 in Taiwan, they sell a mixture of Xiaochi (substantial snacks), drinks, apparel and accessories. Every night around 4-5pm vendors start setting up their stalls that trade until midnight or later. 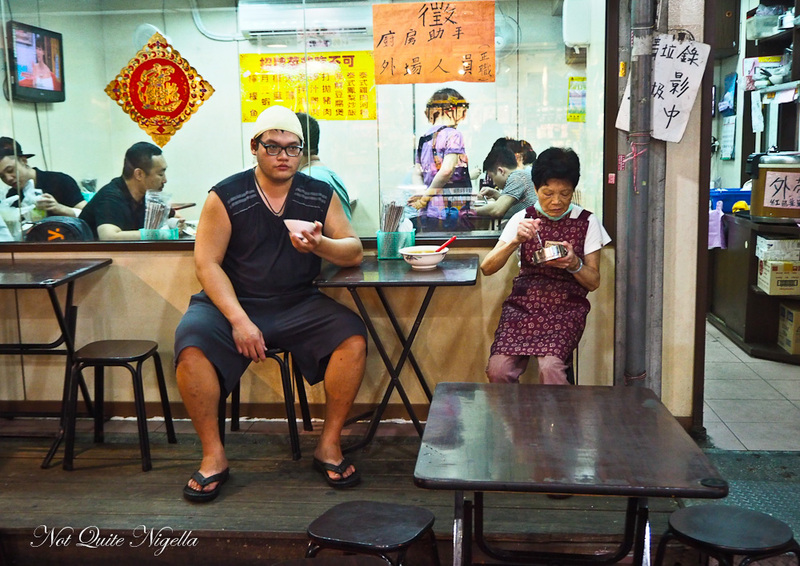 And they're not just for show as the clientele is mostly local Taiwanese who eat out at these regularly. The very reasonable prices ensure that they are always busy with customers. 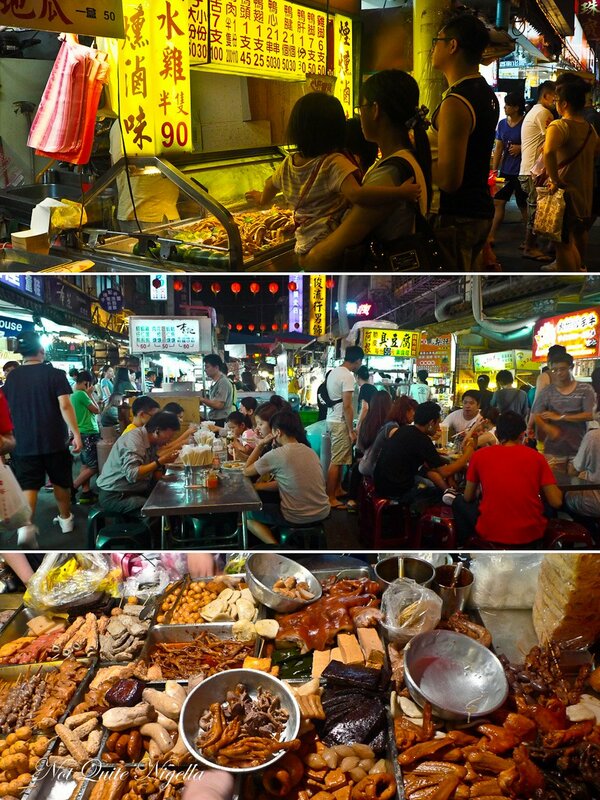 The most famous is perhaps Shilin markets but my favourite was the Raohe Night Market which has a range of food that you don't see at others. The last piece of advice Kathy gave me put me in good stead, "Basically anywhere you see that has a (long) line, join them!". 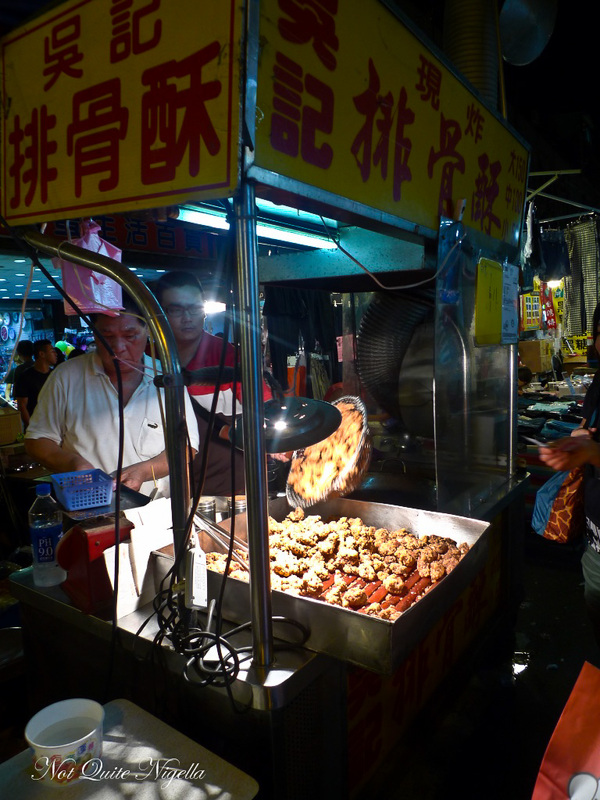 Here are 16 items that you must try when you visit a night market in Taiwan! And the price of items starts at NT20/$0.84AUD! I'm a terrible Chinese person. I can't speak or read Chinese so when I see a drawing of a frog and the words "frogs eggs", well I'm just going to assume that there are actual frogs eggs that they're serving. On closer inspection, they're not. Instead it's a basil seed drink that resembles frog eggs. 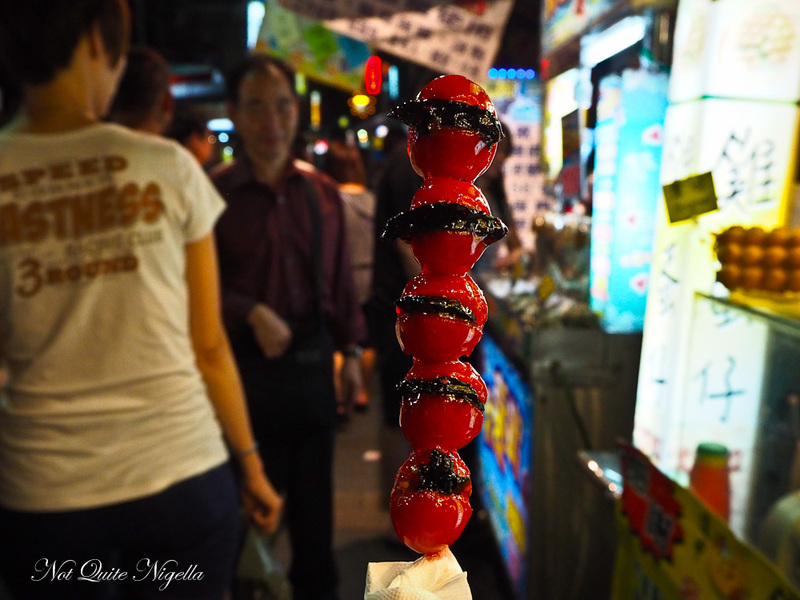 This is different from bubble milk tea with its larger balls - these almost melt in the mouth with a slight resistance. Deep fried milk? What? Having eaten plenty of deep fried things in Dallas, Texas, I was certainly curious. The milk here is in the shape of custard squares that are threaded on a skewer and then dipped in a flour batter and then deep fried. It arrives piping hot the squares morphed into balls during the frying process. Once it has cooled to a non ferocious level we pop one ball into our mouths. It's sweet and milk flavoured and slightly nursery comforting in the way milk tends to be. 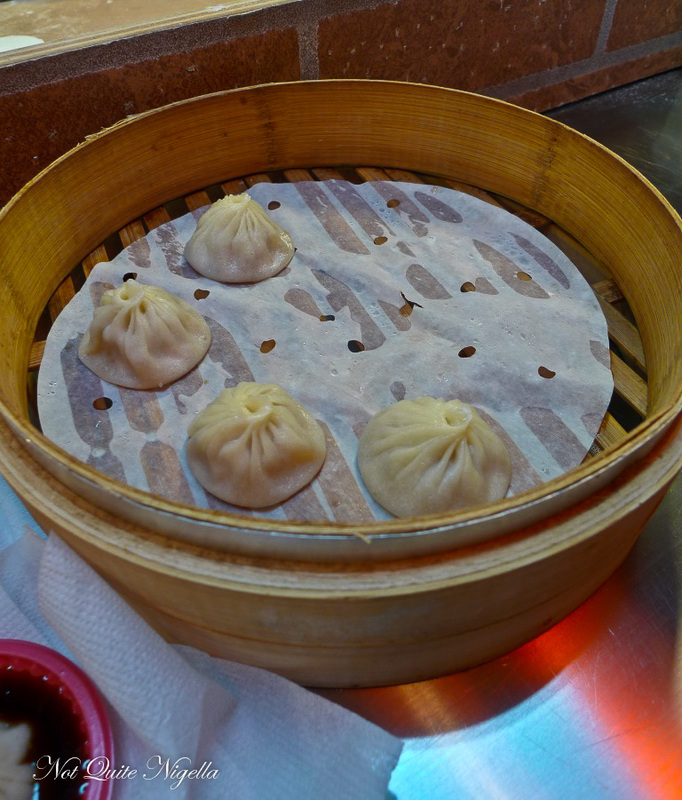 Although xiao long bao soup dumplings originated in Shanghai, nobody has perfected them quite like the Taiwanese chain Din Tai Fung (their 101 Branch is a tourist's mecca). 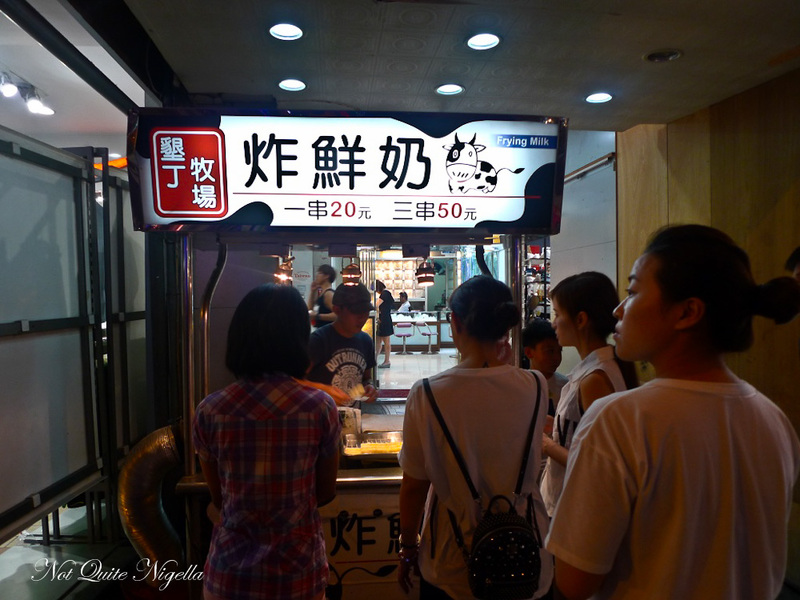 At night markets there is a range of dumplings but there's a crowd gathered at the stand for xiao long bao at Raohe. 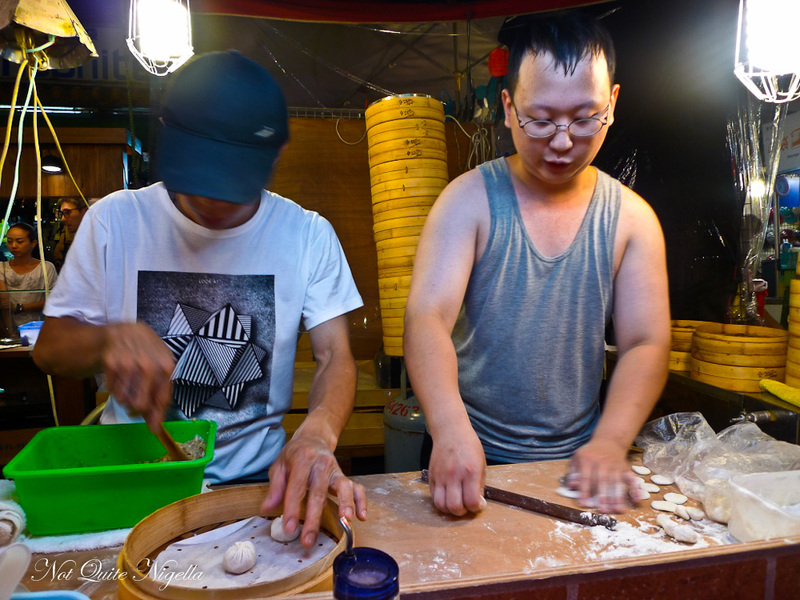 They can barely pleat up these delicious little dumplings quick enough to keep up with demand but they take no shortcuts pleating each dumpling laboriously by hand. Cooked to order you can either sit down or take it away and we take a seat in front of the two men making them. You dip the xiao long bao in the vinegar and ginger and nip a little of the skin to sip the soup. They're delicious and each dumpling is plump with hot soup. We also watch as a girl next to us sips from a passionfruit with a straw stuck in it. Yep that's a thing! 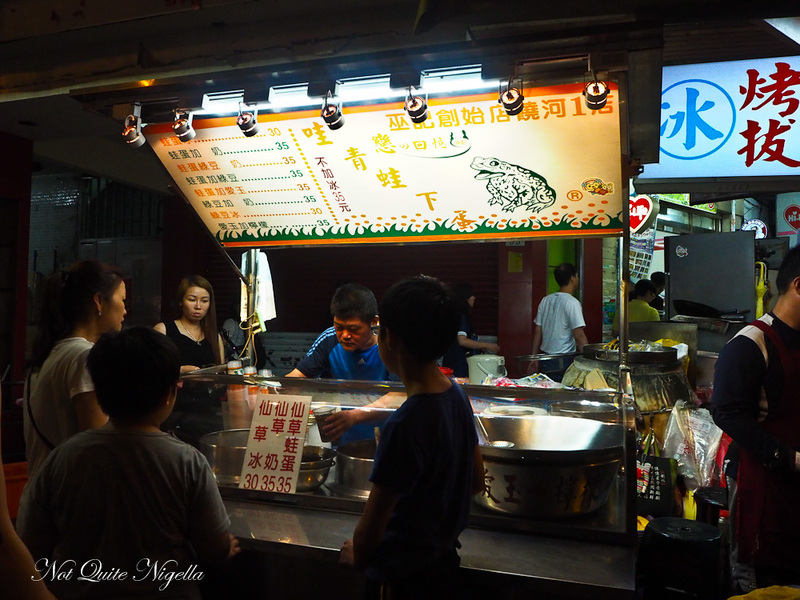 At some night market stands, TV screens do the selling and show various people eating the item on loop. Tamagoyaki is usually seen sliced up and served atop sushi rice. Here the rectangular omelette is sold whole as an egg omelette filled with cheese. 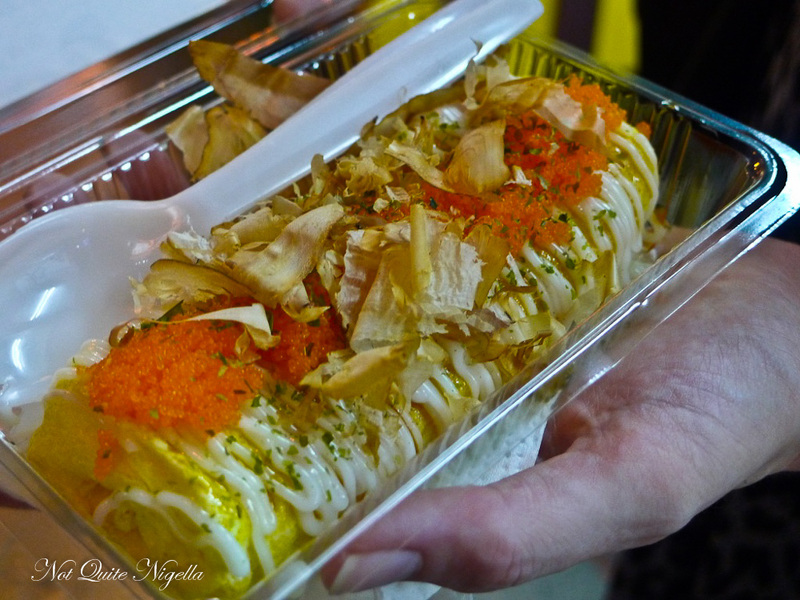 The most popular is the egg omelette with fish roe, bonito flakes, cheese and corn inside. It's sweet, soft and quite tasty indeed! 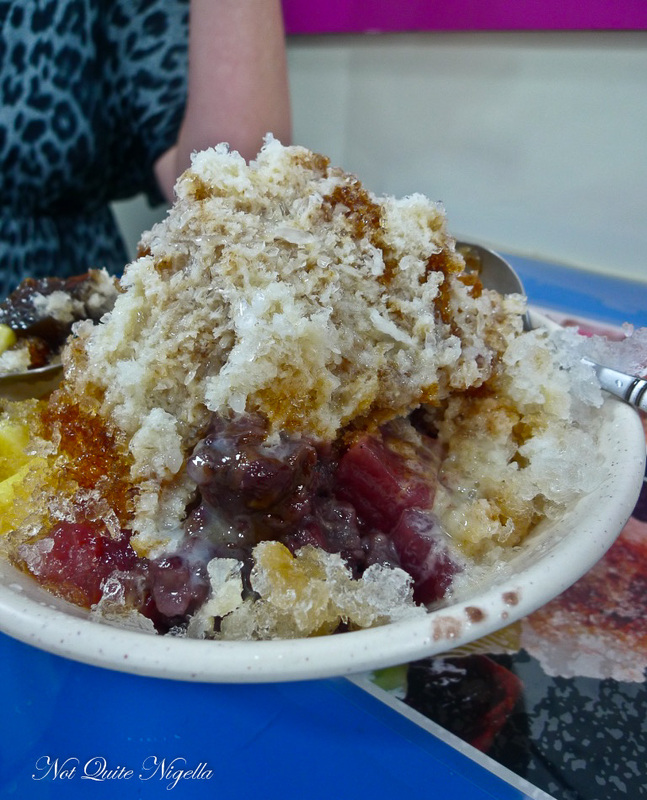 When it's hot and steamy, salvation comes in the form of an enormous bowl of shaved ice with your pick of various toppings. With ours we choose mochi, three kinds of jelly, a custard and red bean. The whole thing is doused in syrup and then we ask for some condensed milk (perhaps a mistake, it was very, very sweet). But it is totally delicious and when we spoon the sweet ice and toppings in our mouths, each spoonful tasting slightly different from the next it's absolute heaven. Quit sugar? Never when this is on offer. 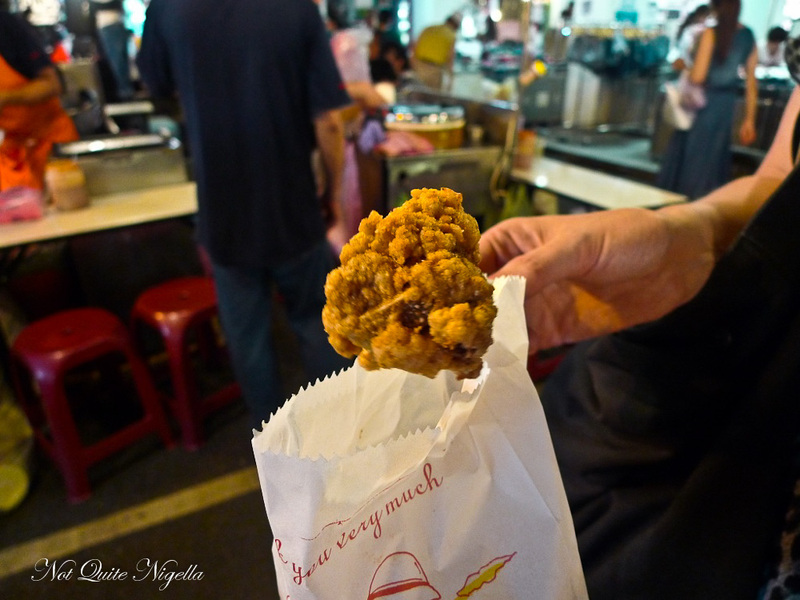 The worldwide chain of Hot Star fried chicken started at Shilin Night market and every market has a variation of fried chicken. Hot Star serves enormous 30cm/1 foot long breaded chicken but as we can get this in Sydney, we go in search of other fried chicken. This comes in the form of popcorn chicken. We order a small serve and they grab a few pieces, weigh them and hand them to us with a skewer. The pieces are bone in and piping hot and delicious with a slightly sweetness to them. And even though I've eaten a lot, I want more. Nothing unleashes stomach space quite like something novel. 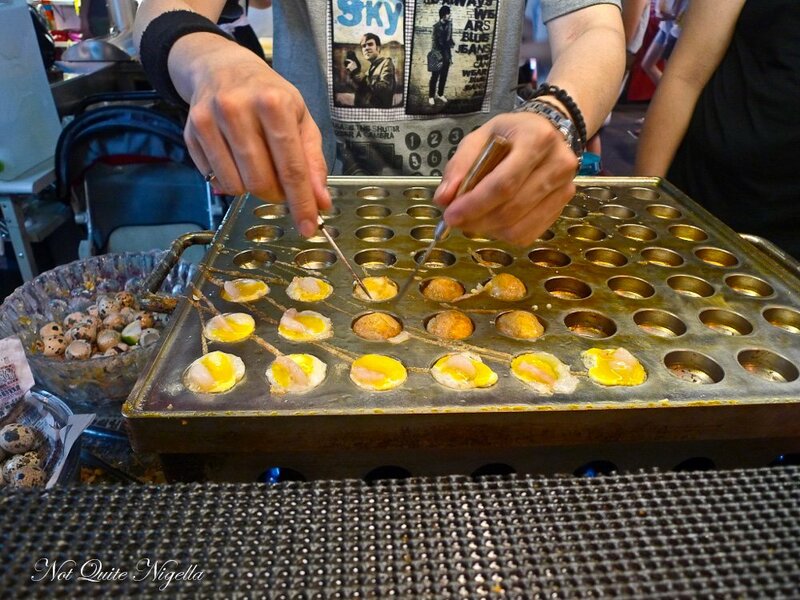 What may first resemble takoyaki is given an updated twist with quail egg and tiny shrimp. Like takoyaki they're turned over and cooked on the other side before being served with a range of toppings from orange yogurt, Thai sour and spice, seaweed or cheese. We go for the most popular one, the honey mustard and it is fantastic. It's slightly sweet but gooey in the centre and creamy. Like eggs benedict with a twist. My lucky number is 8 and this was perhaps my very favourite item at Raohe might market which is saying a lot because it was all pretty good. At the Ciyou temple end of the markets there is another very popular stand (look for the orange aprons) where staff are busy filling up enormous buns with lots of black pepper seasoned pork mince and a fat handful of shallots. These are pulled out of the kiln almost burned on top and enormous in size. They require at least five minutes' wait to cool down but once we take a bite into them they're easily our favourite. 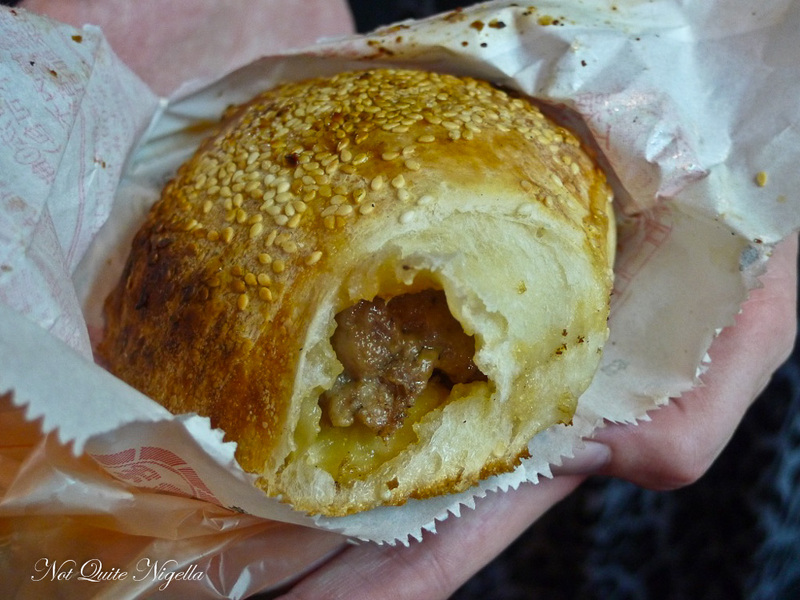 With the perfect amount of seasoning, soft mince, sesame and crispy pastry order one all to yourself. The queue is so long you may as well! 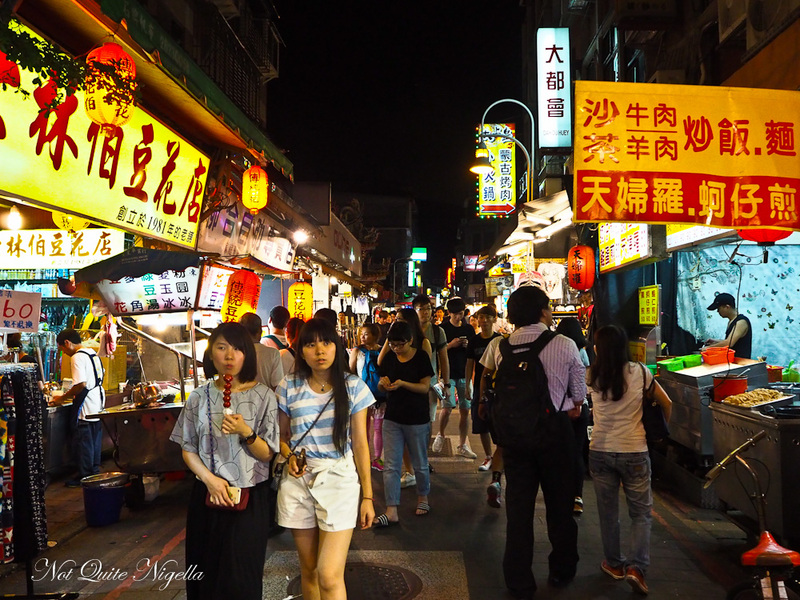 Gongguan Night Markets are located near National Taiwan University so the atmosphere is vibrant and full of students. 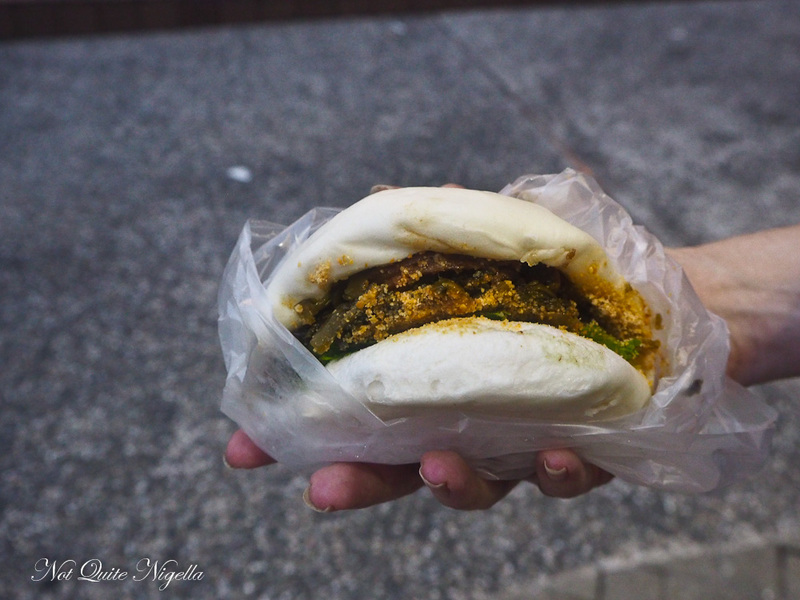 Gua Bao or these foldover steamed buns are no doubt familiar to many but a variation called the Gua bao sis a popular Taiwanese street snack. 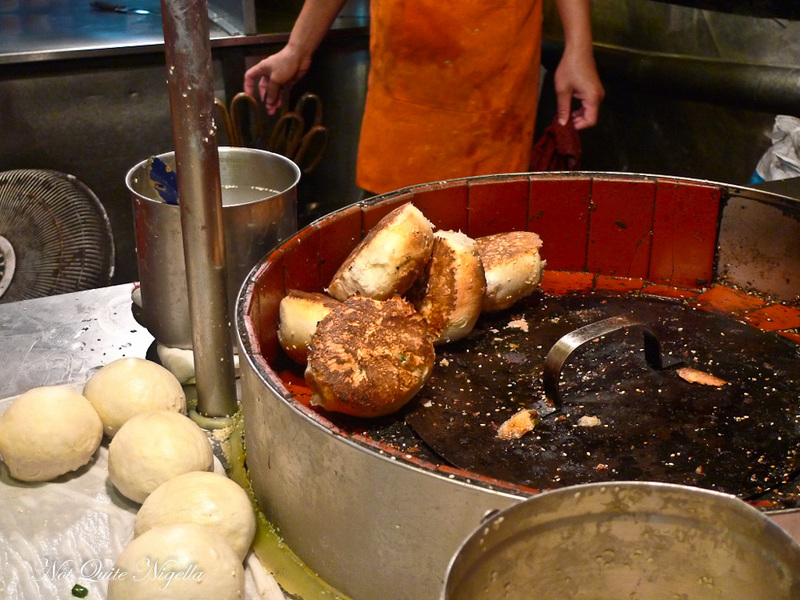 A soft bao filled with pickled vegetables and slices of red cooked pork belly it is given a final sprinkle of peanut powder. It's soft and almost a meal in one it's that large and the queue for these is very long. I think I'd prefer it without the peanut powder and with a bit more pork belly but that's just me. 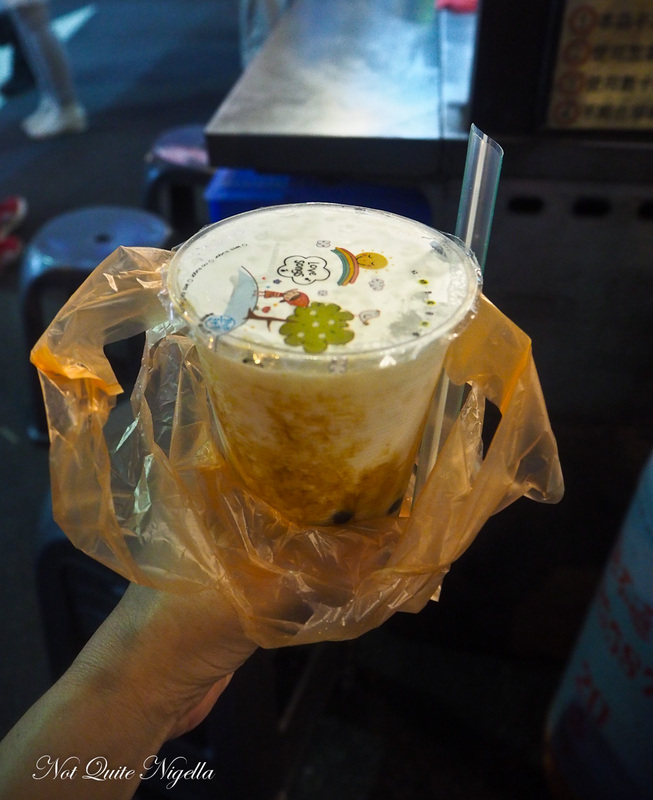 For many people, bubble milk tea isn't anything new but Taiwan is where it really started. 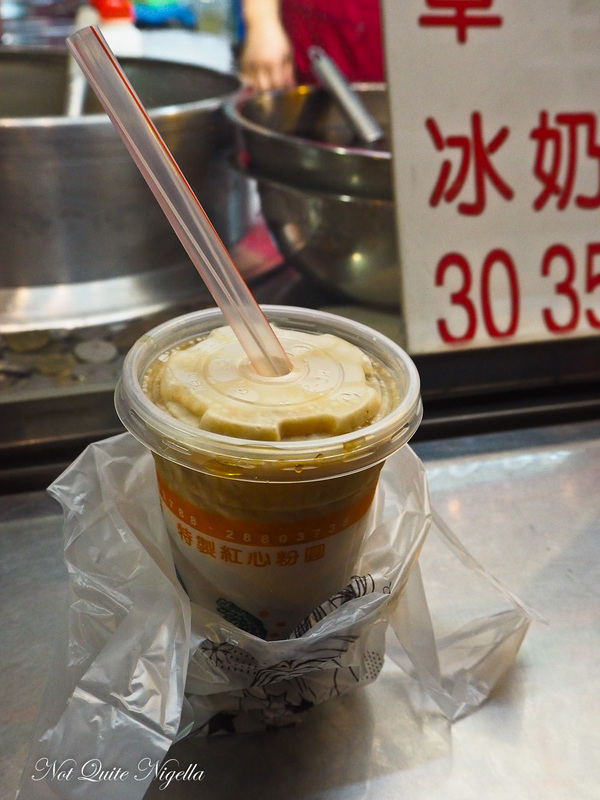 Despite the fact that there is tea in the name, there isn't any tea in the most popular drink served at Chen San Ding stand (opposite the Gua Bao stand above). The queues for both rival each other and no doubt people go from queue to queue. Here the pearls are cooked in a brown sugar syrup. The still warm syrup is mixed with fresh milk and sealed on top. The key to the bubbles are the "QQ texture" which means the chewy springiness of the balls - these are just the right amount of chewiness without becoming bothersome (did I really say that it was bothersome to chew?). It is no wonder that the queue is so long at this place! Okay so this is one that's a little different as we had this on the way to Hualien, about 20 minutes out of Taipei. This is puffier and more doughy and reminds me of a soft version of Hungarian langos. I watch as they roll out the dough using a glass bottle while enormous bags of dough wait in the fridge. They drop them in the large wok of bubbling oil and then deposit a ball of green onion and egg in the centre. This is then flipped over and fried. You then brush it with chilli sauce, a sweet sauce or a spicy soya sauce. And it is incredible. This place is worth finding because it is different from other shallot pancake places and they were one of the best things we ate on the trip. In Taiwan tomatoes are treated as a sweet item and can be poached in sugar and end up on top of cakes. 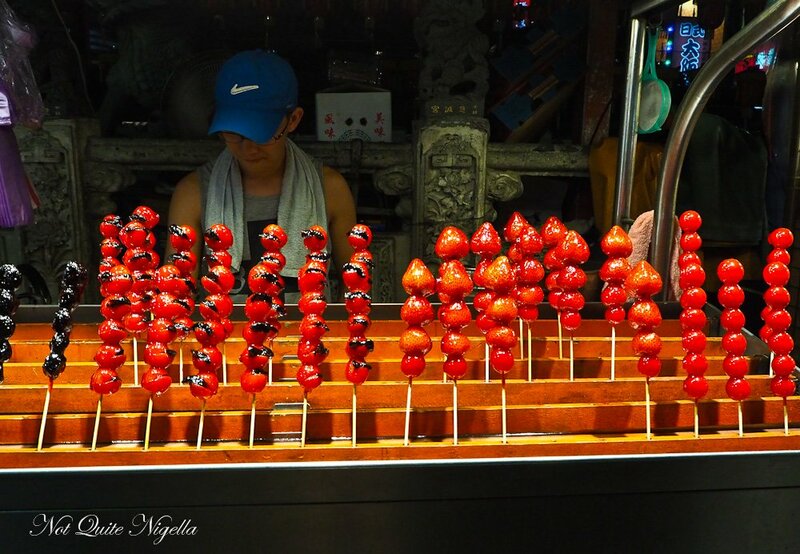 At Shilin night market sweet cherry tomatoes are skewered with slices of plum and dipped in toffee alongside strawberries and plain cherry tomatoes. They're actually not bad at all - the toffee is thin and the sweet acidity of the tomatoes suits the toffee. 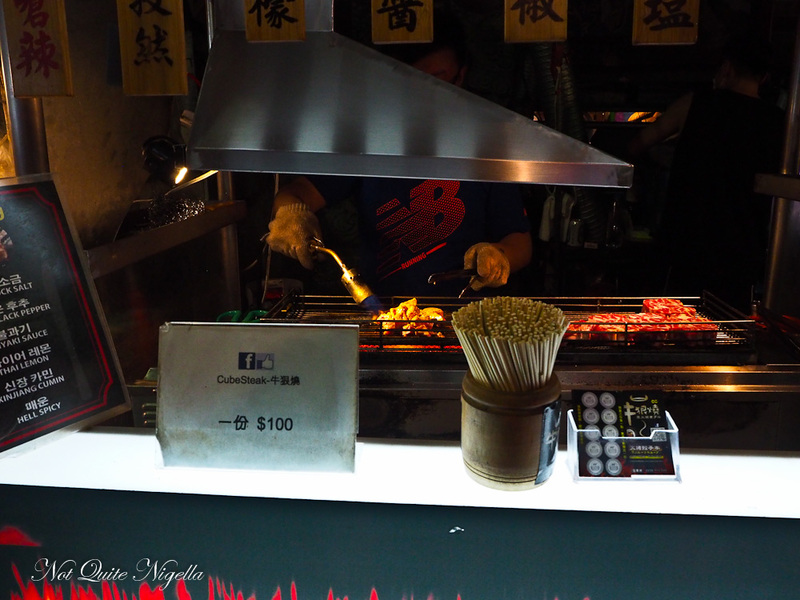 The stand that seems to be at every market is the one selling flame grilled beef cubes. Cooked to order using a large blowtorch they're offered with a choice of different seasonings from Xinjiang cumin, black pepper, Hungarian pepper or Japanese teriyaki sauces. The most popular is the rose pink salt and the beef is perfectly cooked, tender and juicy. Some items are meant for eating while walking, others require a respite break which is always nice in the heat. These were actually eaten at Lao Dang beef noodle which is a restaurant not a stand but they're available in street stalls (we just needed air conditioning and Erin wasn't feeling well). It comes in a few iterations with different types of beef. 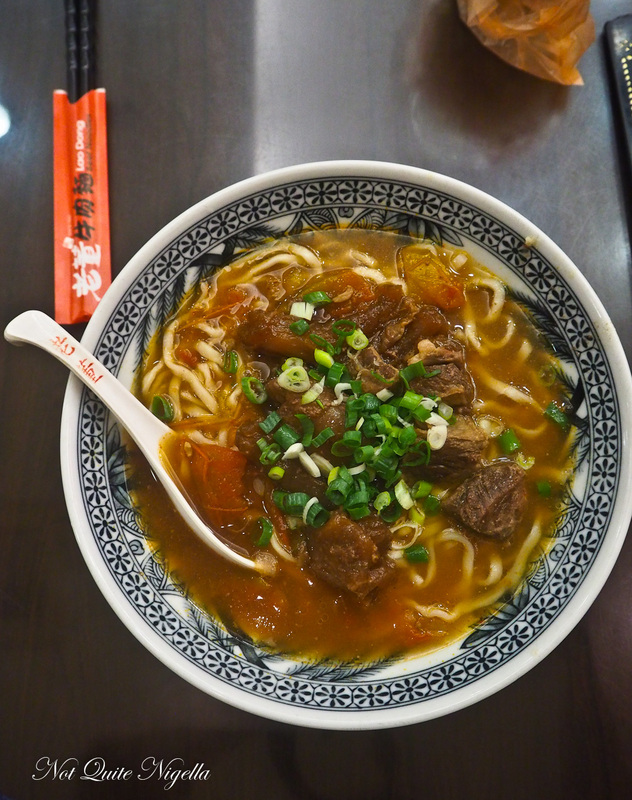 Here the classic braised beef noodle soup comes with soft pieces of beef and a warming, rich broth. 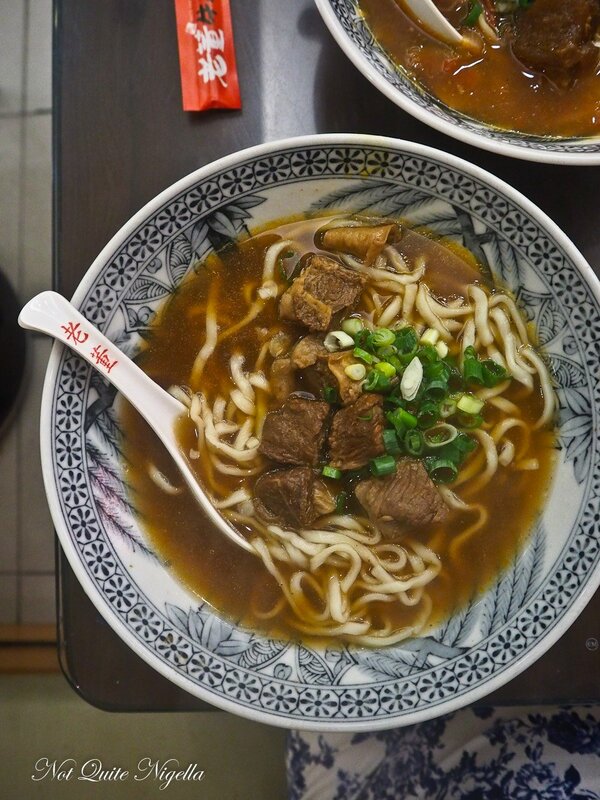 Noodles are hand made and a perfect QQ chewy springy texture. 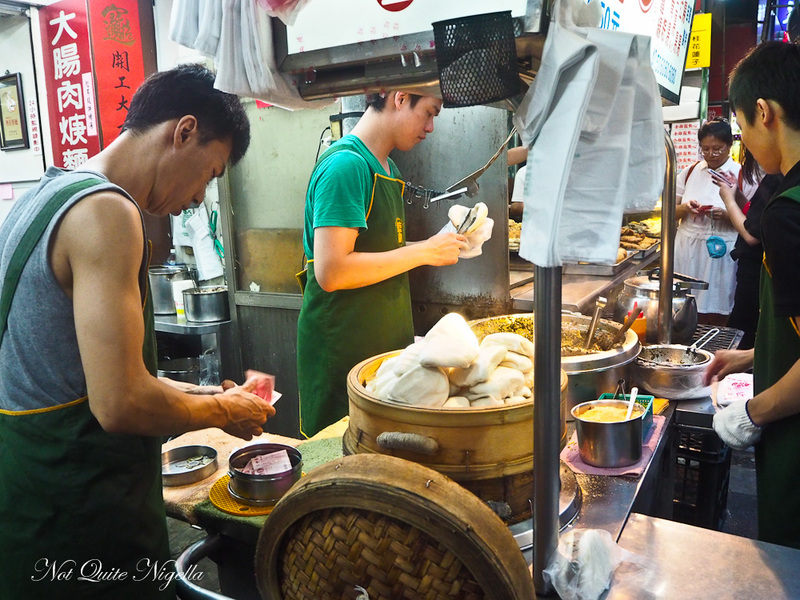 Originally from Chinese muslim culture, it became appropriated in Taiwanese cuisine after the defeat of the Kuomintang Nationalist Party troops in the Chinese civil war. There is also a tomato version with plenty of soft tendon and meat. The tendon is jellied and thick while the tomato lends the soup a sweetness. Out of the two we actually prefer the regular beef noodle soup. 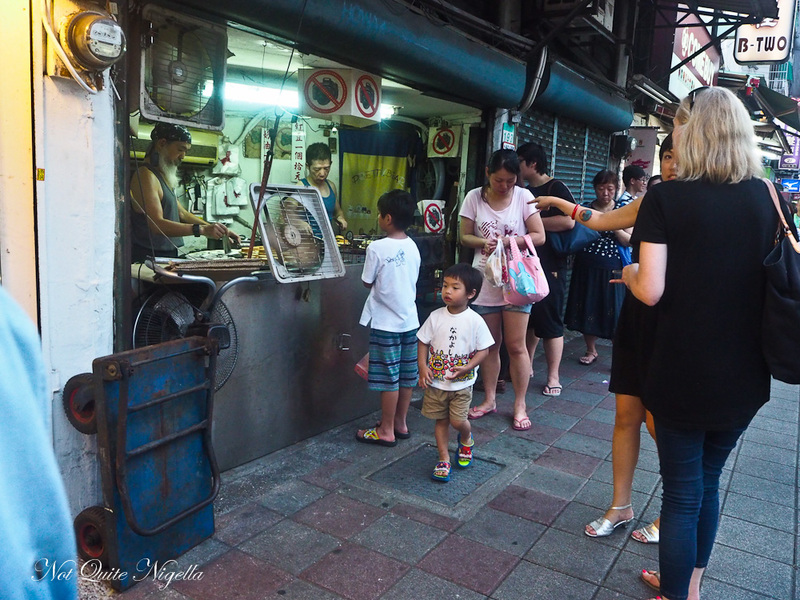 One long queue is for Imagawayaki which are round crispy edged pancakes with either red bean or custard filling. The two whiskered men are gruff and barely nod at customers. They're no nonsense but we can understand that, the temperature must be searing hot behind the two enormous pans. 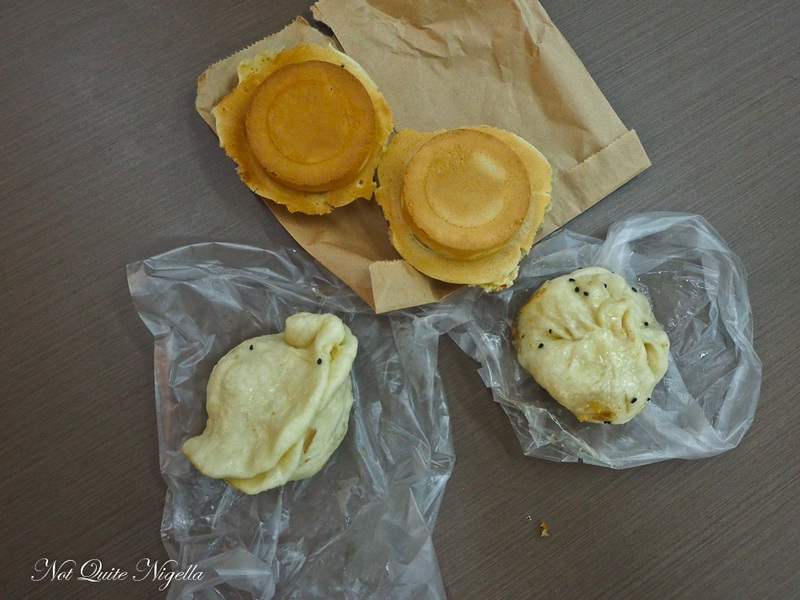 The pancakes are crispy on the outside and filled with a mildly sweet red bean or custard topping. "Is that stinky tofu or an open sewer?" asked Erin every time we passed a stinky tofu stand. 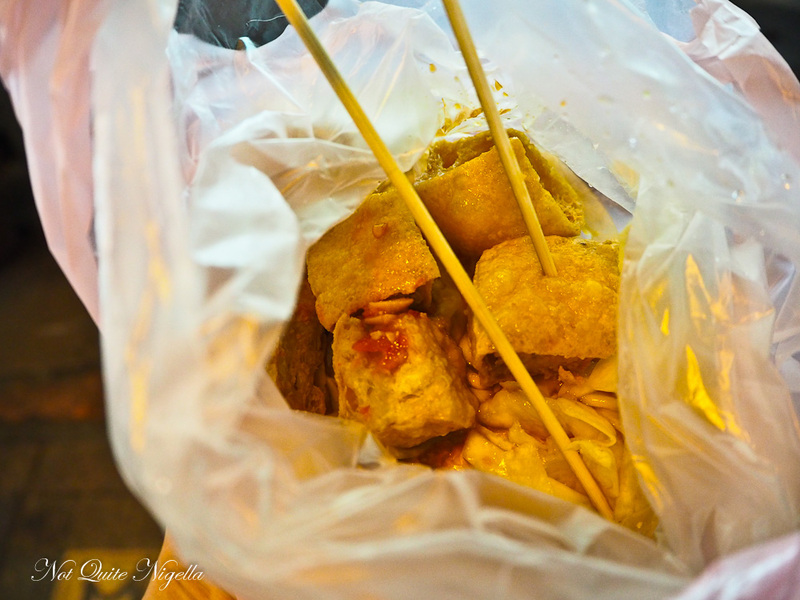 Last but not least in the list is stinky tofu. 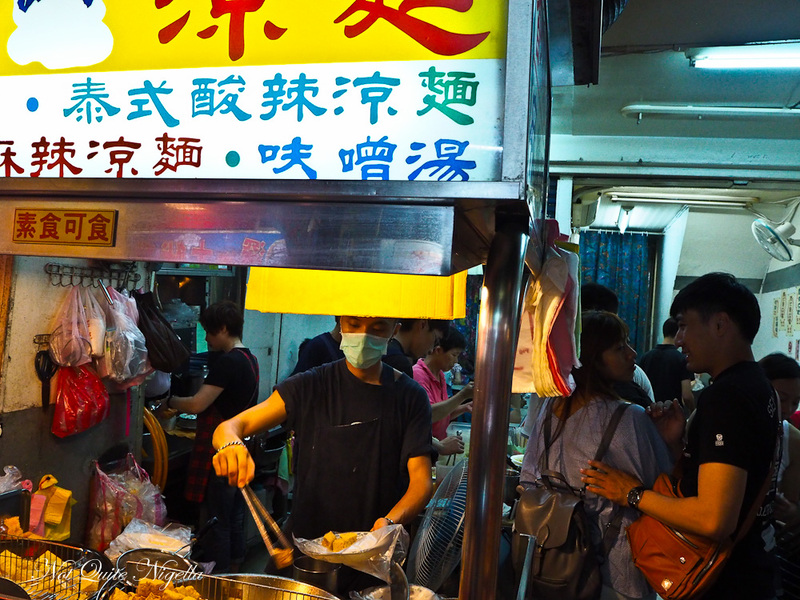 Stinky tofu is a must try and if the waft of garbage tickles your nose and there is a busy stand full of people then chances are that it is a stand for stinky tofu. The tofu is served either crispy dry in squares with pickles on top or stewed in a spicy sauce. It smells much worse than it tastes and if you are used to fish sauce then the taste won't come as much of a surprise. Vendors may ask if you want it spicy or not and I'd recommend choosing spicy if you like chilli. It comes in a double wrapped plastic bag and you pick up the cubes of tofu with a wooden skewer and pop it in your mouth. The tofu is crisp and full of flavour and I could easily eat the whole bag full. The smell really does disappear once you start eating it. Apart from great food, it's a great place to people watch. Or even pet watch as dogs are treated as children. 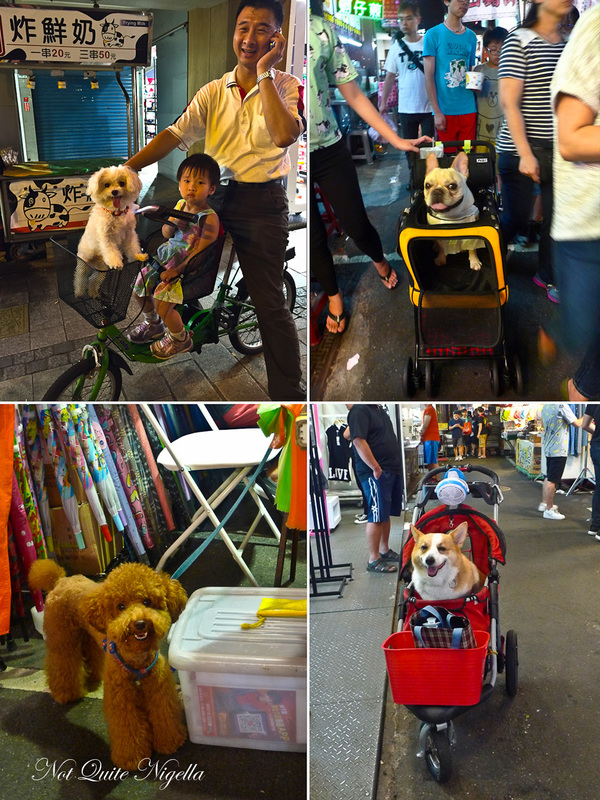 We lost count of the number of dogs that were carried in strollers. There's nothing really gruesome or frightening at the markets so I really recommend joining any long queues where you will be rewarded with nothing but delicious and inexpensive food! 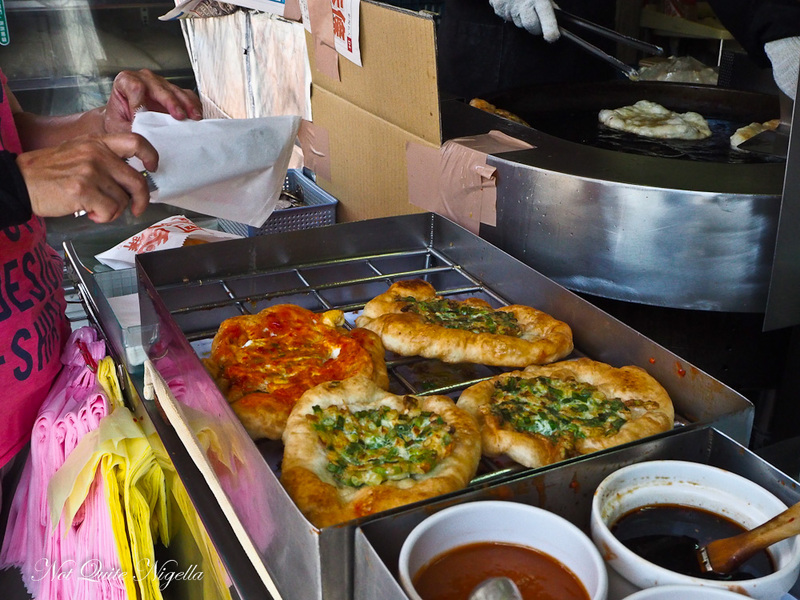 So tell me Dear Reader, where is your favourite city or country for street food? Have you ever eaten any of these foods? Which one appealed to you most? 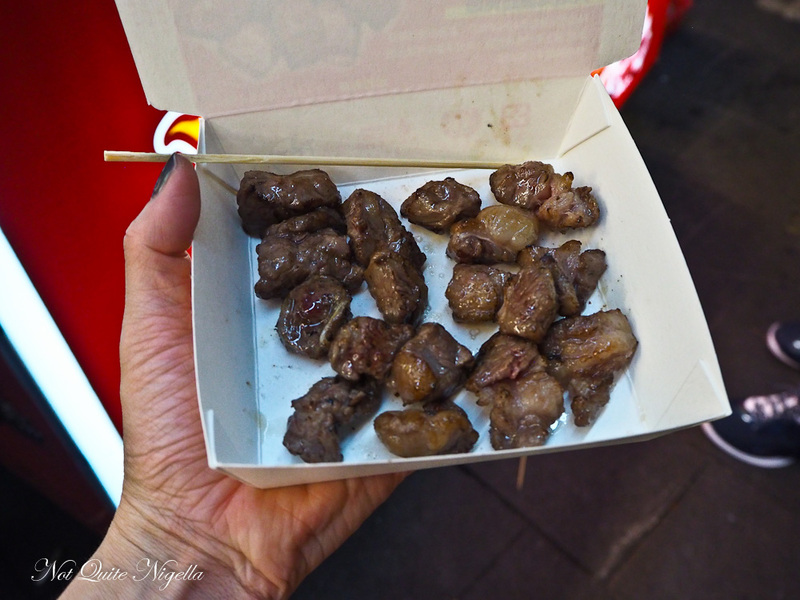 And would you ever try stinky tofu? All food in this post was independently paid for. 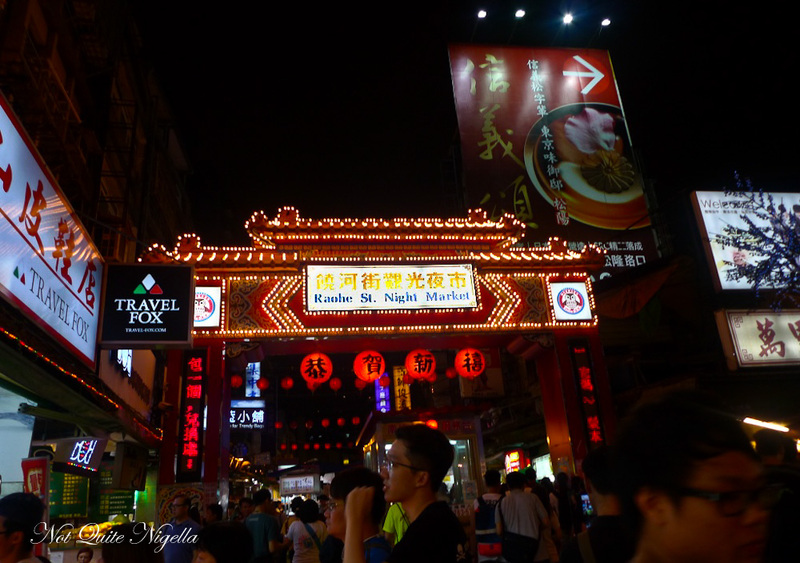 NQN travelled to Taiwan as a guest of Taiwan Tourism. 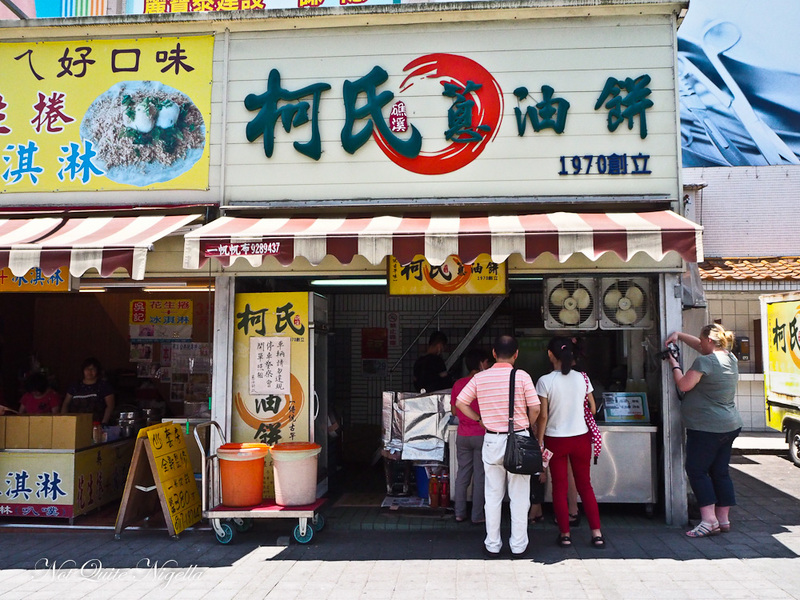 travelWhat to Do When Hitting Hualien & One Thing NOT to do! 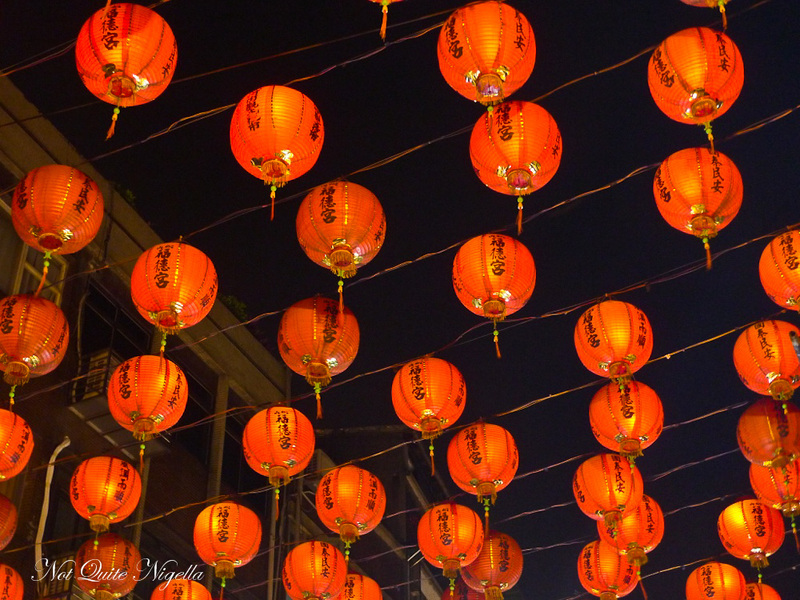 travelA Taste of Taiwan & 10 Tips for Travelling To Taiwan! 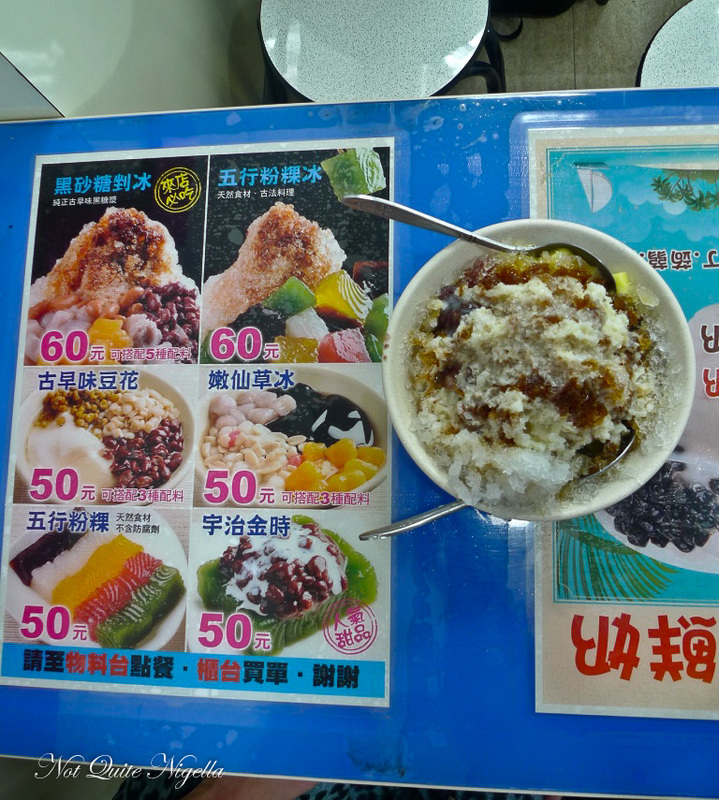 travel What to Do When Hitting Hualien & One Thing NOT to do! 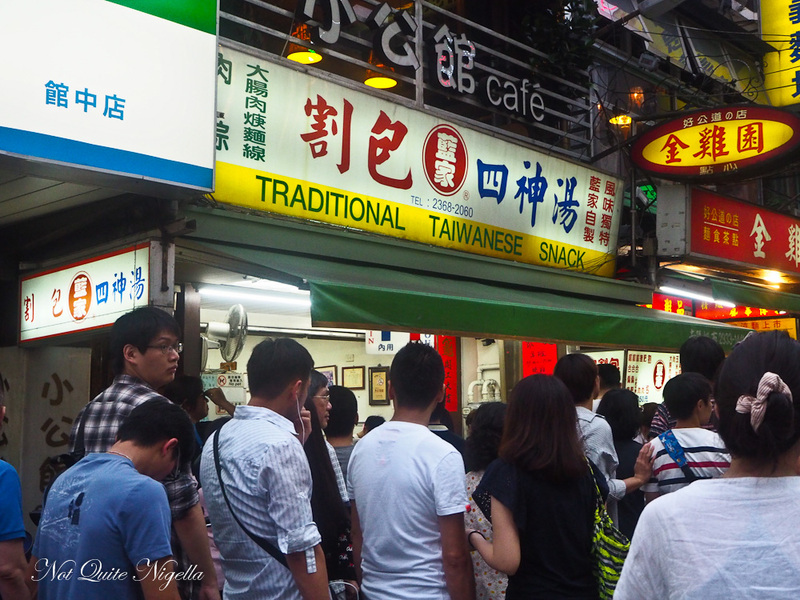 travel A Taste of Taiwan & 10 Tips for Travelling To Taiwan!